Previous post HERE covers Thursday and Friday at the convention. Saturday Lena and I got another late start, skipped breakfast and instead had wonderful early-lunch burritos at Viva Mexico. I should’ve taken pictures! Here’s a picture of me & Lena in the dealer room, photo courtesy of Todd Chicoine. 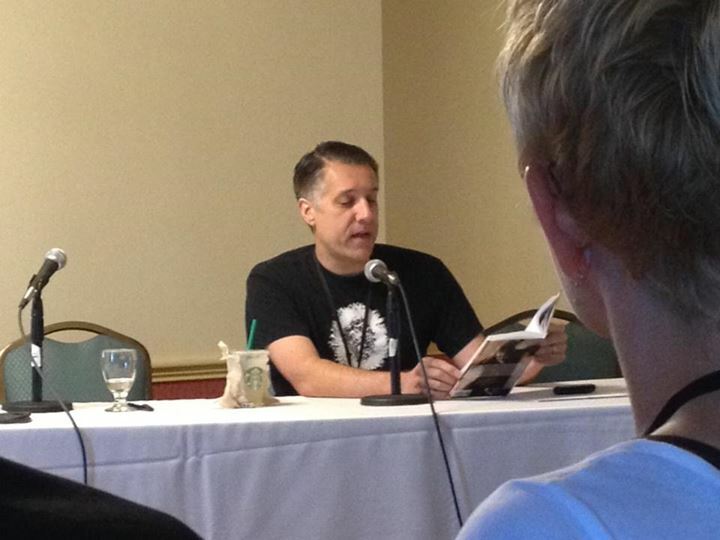 After yet another run-through of the vending areas, we attended the Thomas Ligotti panel. This featured Alex Houston (moderator), Michael Calia, Jon Padgett, Matthew Bartlett and Michael Cisco. Jon Padgett offered quite a few special insights and anecdotes from his long friendship with Ligotti. We sat toward the back and couldn’t hear a couple of the panelists very well, so big thanks to Scott Desmarais for recording video, available below! Immediately after this at 6 PM, just across the hall, was the Looming Low reading. Because we came straight from the other panel, I had to forego my usual fortification of a drink or two just before doing a reading. The event was very well attended, and the room was full, with an especially rowdy contingent of Canadians in back (not visible here). The picture above is co-editor Justin Steele introducing the program. The audience extended further back, behind what’s shown in this photo. I kind of like this one better, though, as it fits the tone of the story. Photo by Michael Wehunt, with my special, secret “Sound of Black” filter applied. In addition to those of us who read, there were a total of 12 contributors to the book in attendance! The crowd was not only large, but very enthusiastic. I signed more books than I’ve signed all in one place, anywhere, ever. I was also delighted to see how many people owned the hardcover. Nothing at all against the paperback — in fact, the art by Yves Tourigny is beautiful and every bit the equal of the hardcover art by Marcela Bolivar — but I love to see people picking up the special limited version despite the higher price. Both versions have the same content, of course, so you can’t go wrong either way. A surprising number of people seemed to have bought one of each. The book appears to be one of the Horror/Weird Fiction events of the year, and I very much look forward to investigating all 26 stories. If you weren’t able to pick up a copy at the con but would like to have one, you can order direct from Dim Shores. Speaking of books and Dim Shores, Sam set aside a few copies of certain out of print Dim Shores chapbooks, intending to sell them at the con, but one of the boxes didn’t arrive until Sunday, after almost everyone had gone. Because of this, a few copies of recent books (previously sold out) are available now via the Dim Shores online store. This includes my own AN IDEAL RETREAT. This hasn’t been for sale in quite a while, and won’t be again, so if you’re ever going to want one of these, grab it up while the store listing is still active. Please note, this last item is a special fundraiser, profits of which go to benefit Joe Pulver, and help offset his ongoing medical costs. SO, after such events as described above, what more could a convention-goer want? Maybe it was time to call it an evening, shut things down early and retire to restful sleep? The answer is, John was unable to attend (and was much missed, and also gossiped-about, in his absence), so the torch has been passed to a new generation. 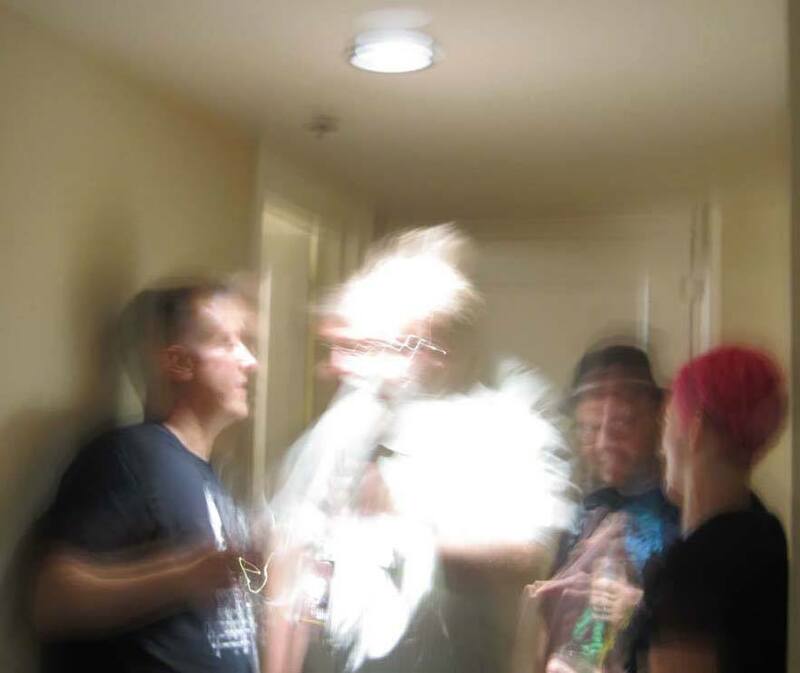 The NecronomiCon 2017 room party of record was held in the room 638, shared by Justin Steel and Sam Cowan, co-editors of Looming Low. There’s a new boss at NecronomiCon! Justin Steele guarding the first deposits to the Iron Bank of Whiskey. Here we have Lee Thomas, Katie Lang-Calia, Livia Llewellyn, Michael Calia, Simon Strantzas and Nicholas Kaufmann. The photo is slightly blurry because the room was so hot and humid, my lens fogged up. Here I am standing by the cool ventilation of the open window with Theresa DeLucci and her husband, mostly talking about how the new Twin Peaks is the best thing ever, and anybody who doesn’t get it is just sad and wrong. And here’s another angle of the cool, open window, with Paul Tremblay, Michael Calia, Me, Teresa, her husband Pritpaul, and Jake Wyckoff. Somehow Lena and I managed to stick around until after 2:30 and there were lots of people still up and around when we left. The next day, Sam reported that he finally expelled the last stragglers at 4 AM. Room party successful! I’ve never been good at falling right asleep when I get home (or at least to my hotel room), so I was up another hour or so, and had to set an alarm to wake me up after a short rest. So it was, the Dreaded Surreal: Landscapes in Weird Fiction panel, with Eric Schaller (moderator), Craig L. Gidney, me, Jeffrey Thomas and Christopher Burke. Here, during introductions, Jeffrey Thomas shows off the novel I just mentioned. That’s a buddy, helping with the promotional boost! The panel went well, with plenty of interesting discussion and questions and recommended reading to check out. Before we know it, though, the thing was over! Not just the panel, but the whole convention. Lena and I had to leave immediately after the panel, so I had my suitcase with me at the table and headed outside without delay. Before we knew it, Lena and I were at the airport, then through security, and NecronomiCon 2017 was already in the rear-view mirror. The whole convention was a wonderful experience. Highlights included the Looming Low reading, the Dim Shores room party, accepting the Robert Bloch award for Joe Pulver, attending the Ligotti panel, and having a chance to meet a great many online friends in person for the first time. The NecronomiCon was a great experience all around. I only wish it happened every year. My sincere thanks to Niels Hobbs and his crew of tireless volunteers for making this happen! Last weekend, Lena and I attended NecronomiCon in Providence for the third time. We left Wednesday evening, flew overnight through Newark and arrived in Providence early Thursday morning. We tried to take a bus downtown, as we did in 2013 and 2015, but found busses were only running every 2 hours! Instead, took a Lyft and found that a much better alternative. Check-in time at the Omni was 4PM and we arrived almost 8 hours before that, but asked at the desk just in case, and they had our room ready! Lena and I were both tired from serious lack of sleep, and even more-than-usually delirious, so went to lunch then came back to crash for an hour or two. Not too many people were in town Thursday, but we hung around a bit with Sam Cowan of Dim Shores until others started to arrive toward evening, notably Sam’s co-editor on Looming Low, Justin Steele. For lunch we went to Viva Mexico, one of our favorite spots in the neighborhood, with Sam and Justin. We ended up seated at a table beside Michael Kelly and his wife Carolyn with Jake Wyckoff, Simon Strantzas and one other person I’m forgetting. The most notable aspect of this encounter was seeing the Kelly duo polishing off a giant pitcher of margarita between them. OK, it was actually pretty much just Michael all by himself. 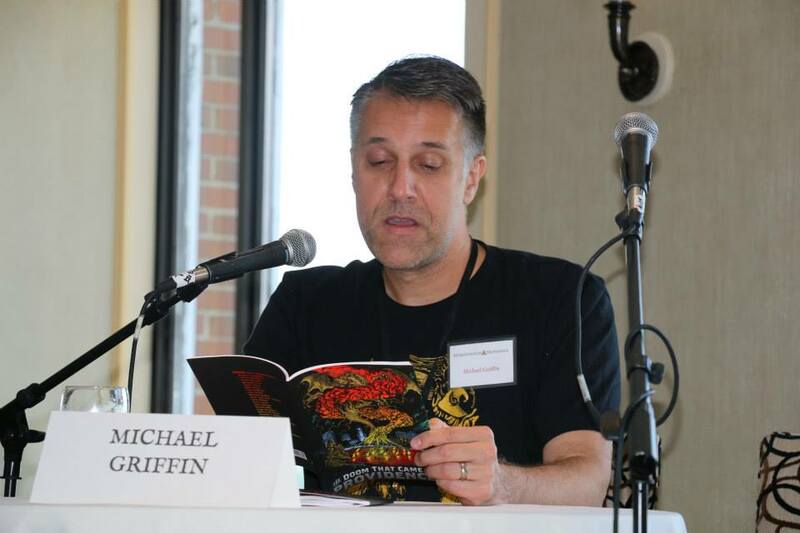 It was most interesting to capture a glimpse into how Michael maintains peak mental sharpness, as well as an athlete’s physical stamina, he needs to continue his great work running Undertow Press and putting out the Year’s Best Weird Fiction series. Lena, Justin, Sam and I went to McCormick’s bar with a few others, including Craig L Gidney, Eric Schaller, Matthew Bartlett, John Glover and Barry Lee Dejasu. I might be forgetting somebody, too. The whole weekend was just such a whirlwind! Anyway, here’s where it really started to feel like a convention, and here too is where most of us saw the Looming Low hardcover for the first time. After a bit of random goofing around after dinner, Lena and I decided to turn in early. Though it was tempting to continue hanging around with friends, we were both pretty woozy, since we’d had only an hour or two of sleep the night before. Friday, we slept in a bit, missed several breakfast invite text messages, and ended up grabbing a late breakfast in McCormick’s. We also decided we like the idea of getting some sleep, and eating a meal that covers both breakfast and lunch, so we don’t have to eat three meals at restaurants every day. After, we spent a little time in the dealer room, talking with Sam as he set up the Dim Shores table. Others were offering to sell all kinds of merchandise.. every kind of temptation imaginable! I bought almost nothing, not because there wasn’t an abundant bounty of stuff I coveted, but because I travelled with a tiny suitcase. Still, I couldn’t pass up an early release of the new collection by one of my favorite writers, S.P. Miskowski. Strange is the Night comes out soon from Trepidation, the same division of Journalstone that published my own novel Hieroglyphs of Blood and Bone, as well as S.P.’s recent novel I Wish I Was Like You, which has been my favorite read of the summer. We spent more time in the upstairs dealer room, hanging around the Dim Shores table, and spending a bit of time signing some books, and checking out Journalstone, Hippocampus and other dealers. The downstairs dealer room, seen here, was larger and busier. I think many people shopping down there didn’t even realize there was another dealer room up above until later in the convention, when the traffic seemed to equalize a bit. 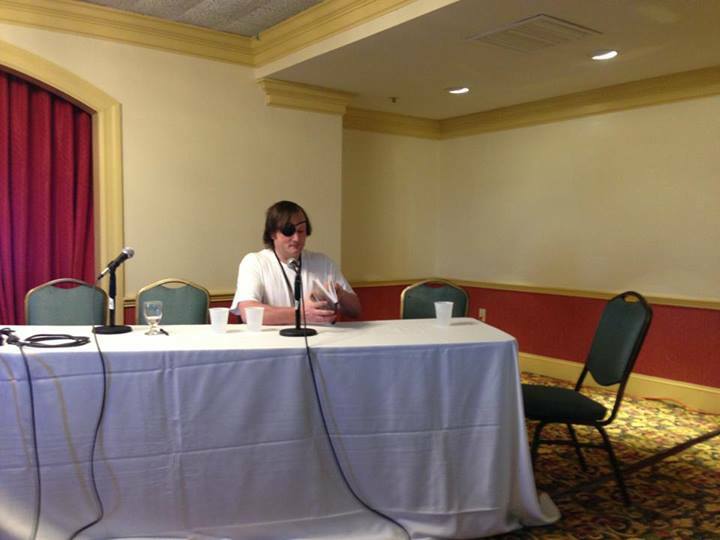 My first panel, Friday at 3PM, was ELDRITCH ARTHOUSE. I discussed strange films with Richard Stanley, Gemma Files, Philip Gelatt (moderator), Joseph E Dwyer, me, Izzy Lee and Heather Buckley. It was a lot of fun, interesting and entertaining, and I think the audience went away with several films or directors in mind to check out. There was a fair amount of talk about Tarkovsky’s Stalker and Zulawski’s Possession, both amazing and artful films of special interest to the “weird” community. I was able to talk a bit about David Lynch and a bit more about Lars von Trier and Antichrist (which remains a powerful film despite the presence of the talking fox), and was happy to listen to lots of other good stories, anecdotes and information. After, Heather Buckley had the very good idea that the world needs a Ken Russell panel in the future. Yes! That evening was the Guest Reception, restricted to Guests and Gold Key ticket holders, and held up on the 17th floor of the Biltmore. Following conversation and drinks and small plates of food, NecronomiCon coordinator Niels Hobbs presented the Robert Bloch Awards. I had been informed in advance that I needed to be present to accept an award on behalf of a friend who could not be present. One of two such award was given to my friend Joe Pulver, who at the last minute was prevented from attending due to a health scare. It was a shame Joe had to miss receiving this award in person, but it was wonderful to hear the appreciation Niels Hobbs expressed for Joe and his influence upon the community. After Niels spoke, it was my pleasure to say a little about what Providence and NecronomiCon mean to him, and his wife Katrin. I was honored to be a small part of the occasion. Here is a camera phone video of Niels making a speech honoring Joe, and presenting the award, then my own remarks accepting the award for Joe, and expressing how I believe Joe feels about this event and the people surrounding it. The video also shows the presentation of the second award. The whole event was very nice, though of course everyone was a bit sad because we all knew how happy it would have made Joe if he’d been able to receive the award in person. The photos and video were passed along to his wife Katrin Pulver, who shared the story with Joe in the hospital. After the reception, we went back to Sam Cowan and Justin Steele’s room for a small get-together. We enjoyed a little taste of the very special whiskey Justin had obtained for room party to be held by Dim Shores to celebrate the release of Looming Low. This small group, anticipating the more challenging adventure of the big Saturday night party to come, took it somewhat easy, tasted the good stuff, and conversed in hushed, reverent tones. It was almost civilized! This gets us through Friday night, roughly the first half of the NecronomiCon 2017 adventure. If I’ve forgotten anything from Thursday or Friday, let me know! I’ll post a follow-up, covering Saturday and Sunday, very soon. Here are my scheduled activites at NecronomiCon Providence 2017, which happens August 17-20. Jodorowsky, Lynch, Gilliam, Maddin, Tarkovsky… Arthouse cinema directors have long been praised for their use of strange and abstract elements. How much of these narrative and visuals elements are rooted in literary works, particularly in Weird fiction? What parallels may be drawn between notable works of film and particular works of the Weird? External landscapes have been something of a dark playground for weird fiction writers and artists throughout the history of the genre. Many bizarre and unsettling places have served as the settings for countless memorable works. Which of these fictional places have been most memorable in the minds of artists and writers working in horror, weird fiction, and science fiction today? What strange, terrifying places may yet be created? And how might they steer the genre in terms of narrative structure and content? Of course, much of the fun of this convention, and any other, comes from the many unscheduled and random interactions, browsing the dealer room, enjoying drinks and meals, meeting new friends and seeing old friends yet again. I very much look forward to NecronomiCon Providence next week! Just back from ReaderCon 2017, and I may have more to say about that soon. For now, just a couple of notes about news from today’s Dim Shores email update. 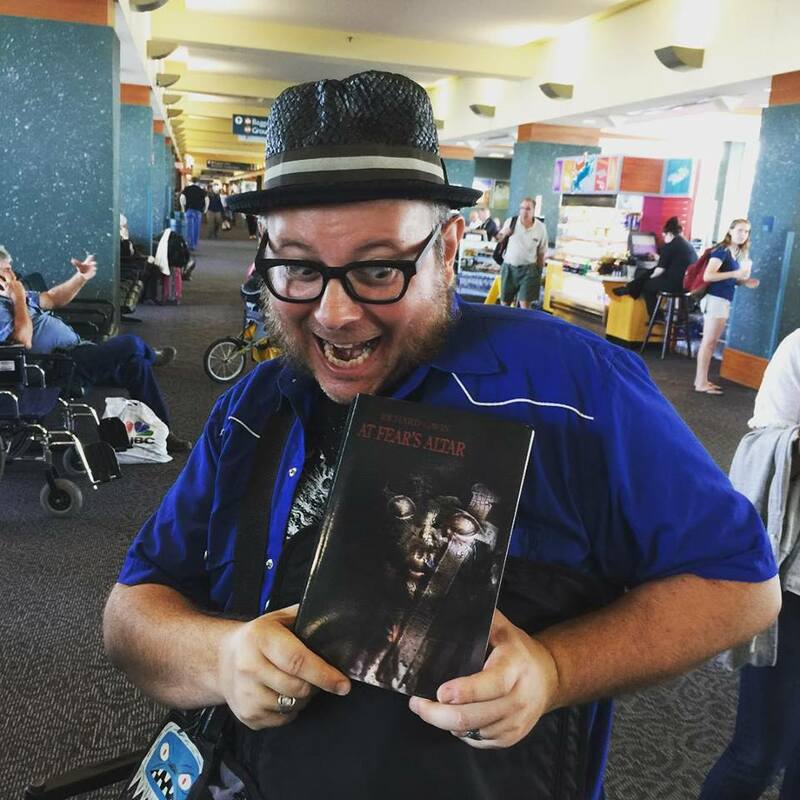 First, Sam Cowan of Dim Shores confirms that Looming Low (the first installment) will in fact be released at NecronomiCon Providence in both Deluxe Hardcover and Trade Paperback. You can order copies to pick up at the con, or to be mailed out afterward. 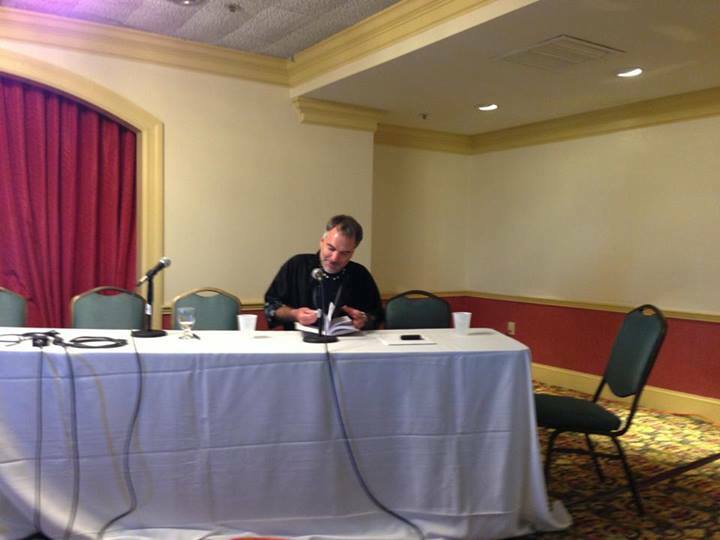 Looming Low was talked about quite a bit at ReaderCon, and clearly a lot of people are very excited about it. So, if you missed out on any of these, make sure you race directly to the Dim Shores table in the dealer room as soon as you can! I’m most definitely looking forward to seeing the book and hearing all these readers together! If you care to zoom back-weird through time and read my preview of NecronomiCon Providence 2015, zoom HERE. So, now it’s over, in fact it’s been over for a month already! I used to write a lengthy and extremely detailed report after every convention. While I love reading posts like that, and they’re actually fun to write, they’re just too time consuming. So instead, how ’bout a photo or two, and a brief rundown of highlights? 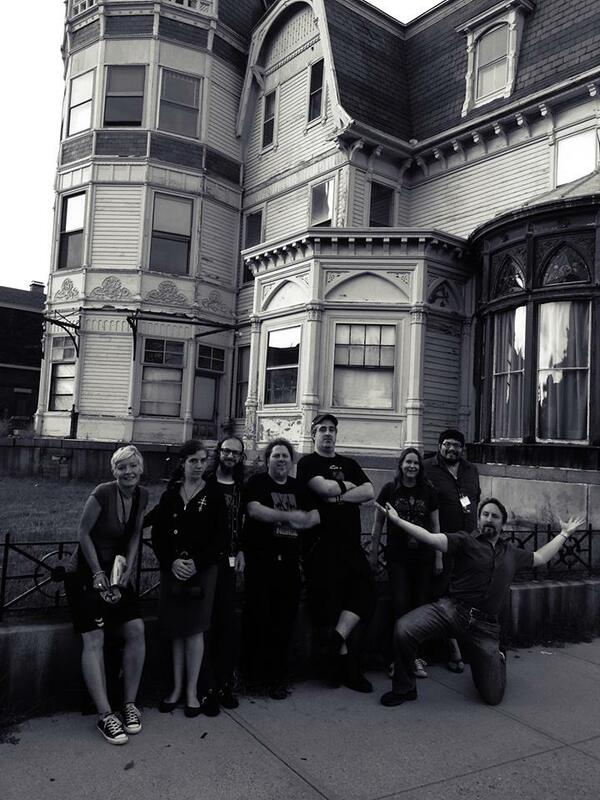 NecronomiCon 2015 in Providence seemed to be the big 2015 convention most people were anticipating with excitement. The 2013 event was a lot of fun for everybody I spoke with. It was the last opportunity I had to meet some of my favorite writers like Laird Barron and Richard Gavin, who don’t attend a lot of events. I heard from several people who said they may not make it to any other conventions in 2015, but they were definitely not going to miss NecronomiCon. 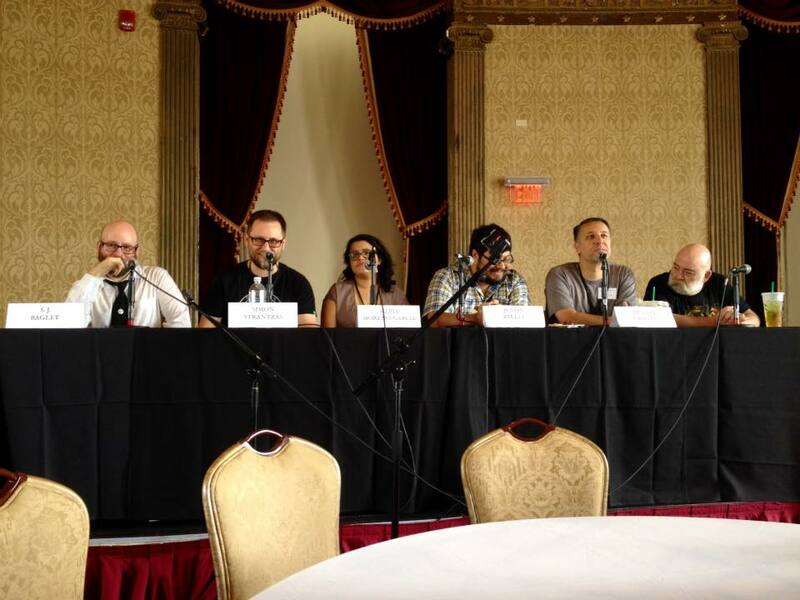 At the 2013 NecronomiCon, almost everyone stayed at the Biltmore Hotel, where most of the panels and readings were held. This time, though, many of us stayed at the Omni Hotel, on the other side of the road destruction between the two main hotels. 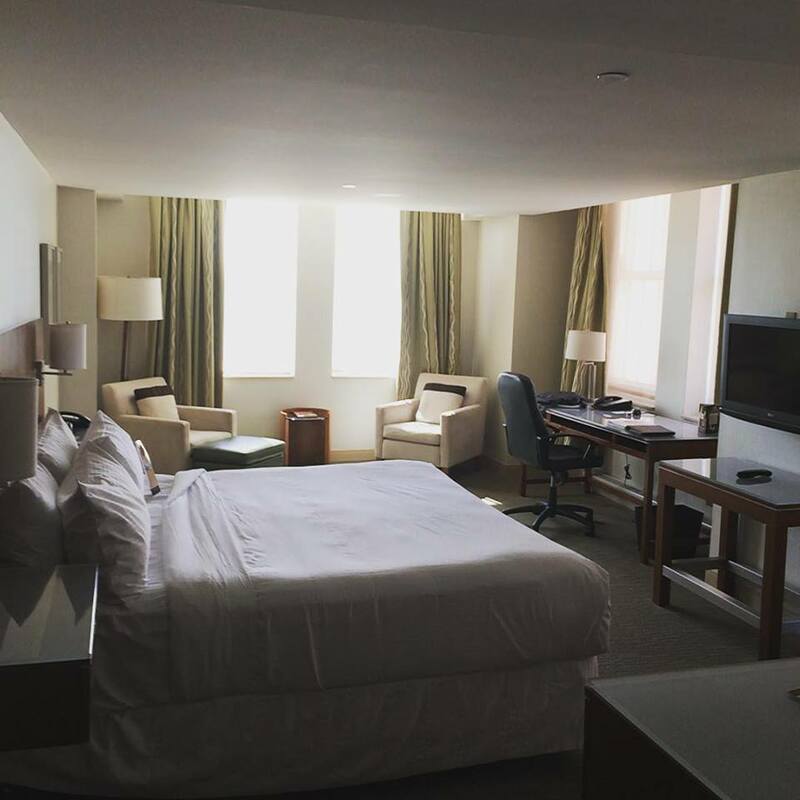 We were pleasantly surprised at our room — big and modern and clean! The bathroom (not pictured) was almost as big as the rest of our room, and included not only a huge stone tile walk-in shower, but also a giant tub. If I ever need to stay in Providence for weeks on end, this is the room I want. As it turned out, we were so busy on this short trip, we didn’t spend much time here. An interesting thing about the Omni is that the rooms are primarily split into two towers (secretly code-named Barad-dur and Orthanc), and each tower’s elevators require a room key card. But the key cards from one tower are compatible only with the one elevator, not the other. This created a situation where we wanted to meet up with friends who were staying in the very same hotel, but we couldn’t take the elevator up to get to each other’s rooms, and had to text each other and meet up down in the lobby. I can’t think of a great reason why your room key gets you access to half the Omni’s zillion rooms, but not the other half. 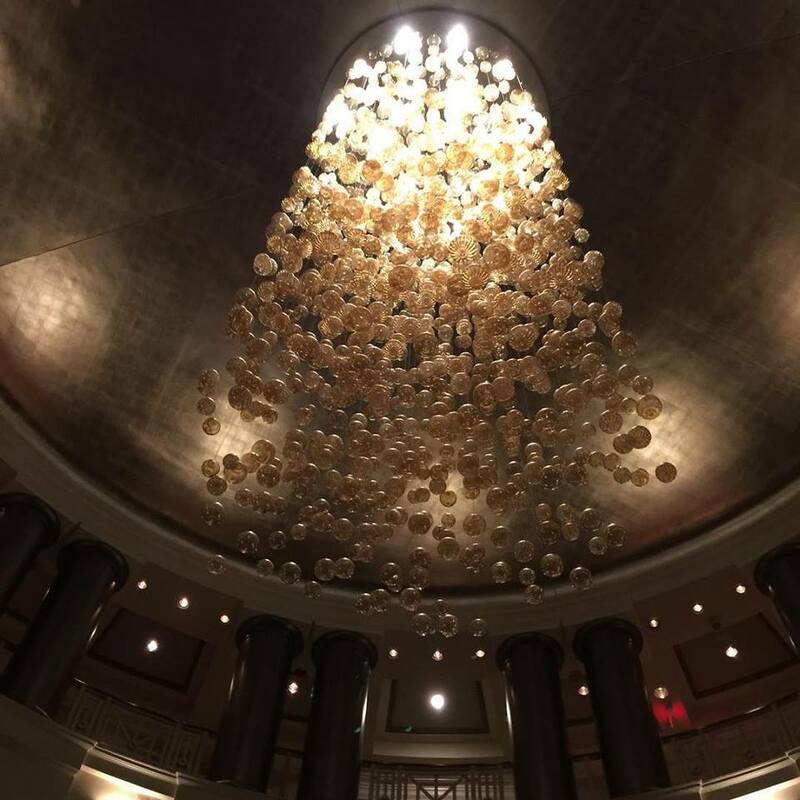 Speaking of the Omni’s lobby, it had the most interesting glass sculpture hanging overhead. Everyone who saw the photos compared it to a shoggoth, so the shoggoth sculpture it will forever be named. 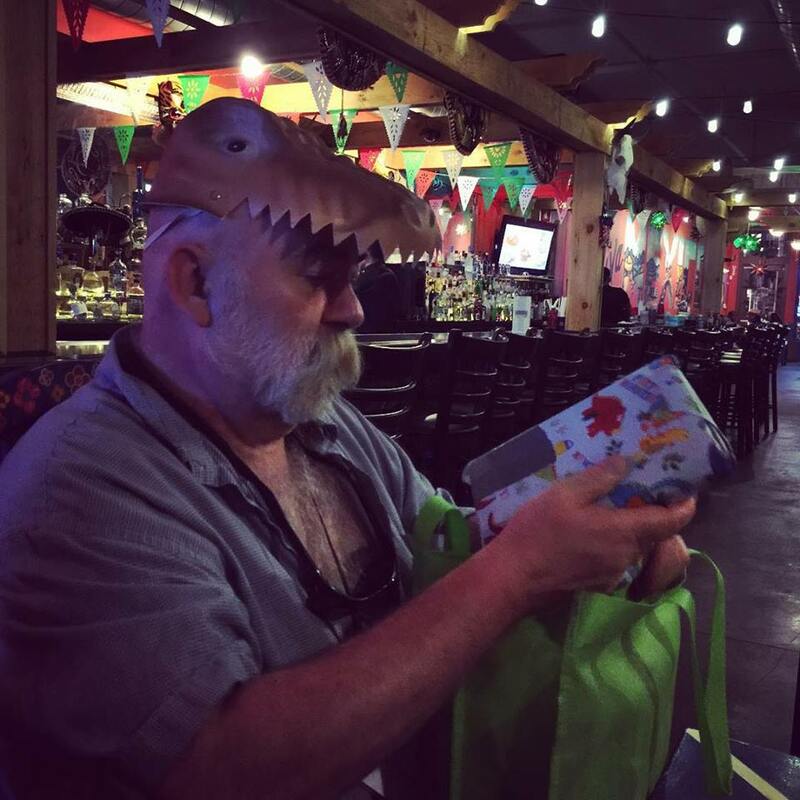 A few people had gifts for Joe Pulver (photo above) since his birthday was the month before, and mailing gifts to Germany is all insane-crazy expensive. Our first dinner was in a big group at the Viva Mexico Cantina. The food was pretty good, but down at the end of the bar, the music was loud and TV sports blared, creating a pretty awful cacophony which left even those of us with perfect hearing unable to follow conversations happening only a few feet away. Every time I go to a convention, one of the main things I come away with is a determination that next time I will avoid large group meals in noisy venues! 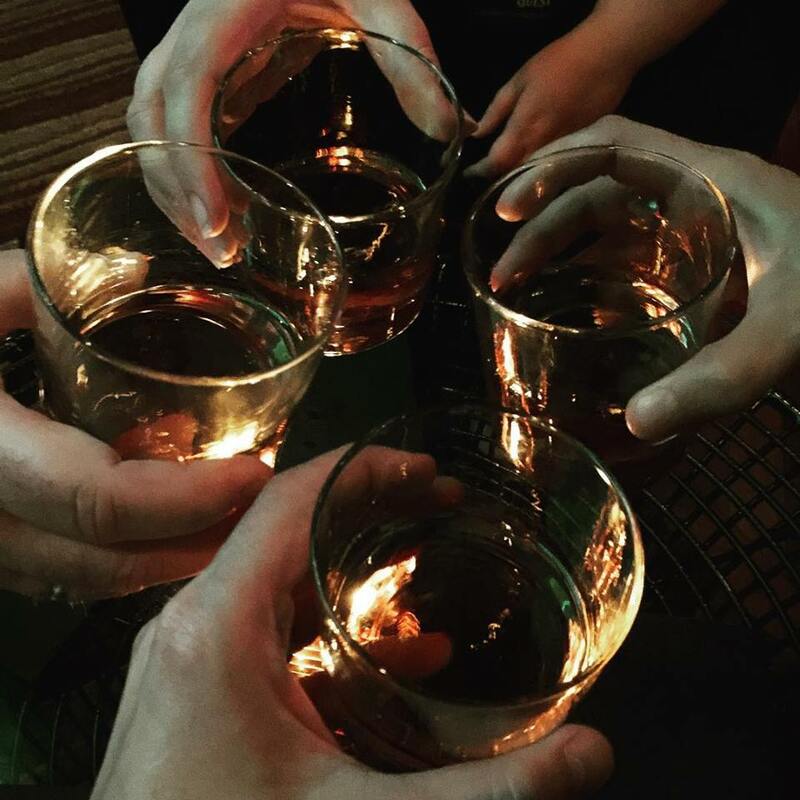 Late at night, after at least one of us had a successful business meeting, my wife Lena and I had a drink with Joe Pulver and his wife Kat to toast Joe’s brand-new contract with publisher Fedogan and Bremer for an anthology in tribute to The Cabinet of Dr. Caligari. I love this movie, and know how long this project has been a dream of Joe’s, so it’s wonderful that it has the support of an excellent publisher. Many great writers have already agreed to participate. I’m sure we’ll hear more information from Joe and F&B soon about this very promising book. 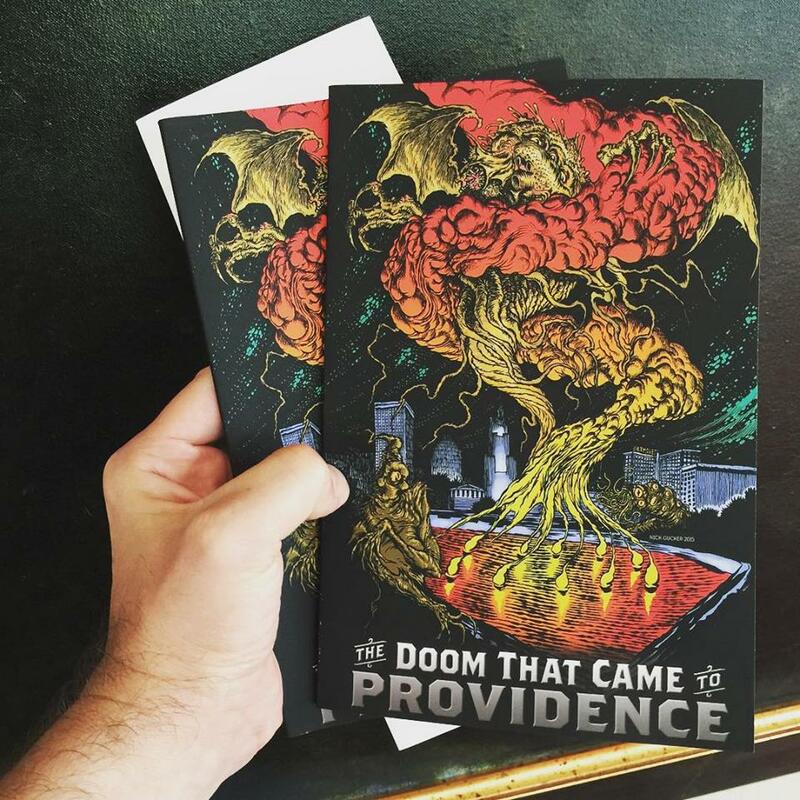 … and speaking of Joe, AKA Joseph S. Pulver Sr., one of my first priorities upon arriving in Providence was to get my hands on copies of The Doom That Came to Providence, the round robin project Joe edited as a special treat related to this event. All the stories relate to the “Water Fire” event from the 2013 con, with everybody taking a different angle on strange happenings that may or may not have gone down that night. The books turned out great – check out the beautiful cover art by Nick Gucker! 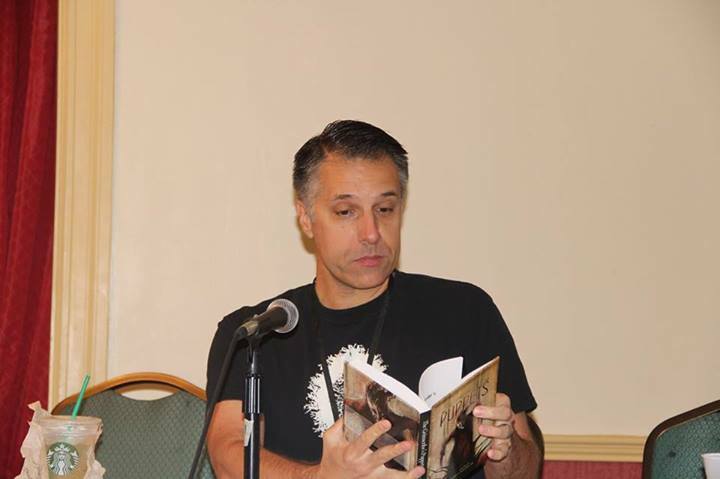 Here I am reading my story “I’m Looking for Nick Cowan or Cody Steele from The Doom That Came to Providence. I thought the reading went pretty well, and a very good crowd attended. I read along with Scott Thomas, David Neilsen and Peter Rawlik. Above photo by Matthew Carpenter. Speaking of the audience for my reading, I snapped a couple of pictures of those assembled. Above you see the kind of wild and crazy folks who show up to events like this. That’s the reclusive genius Michael Cisco on the left and darling Nikki Guerlain on the right. See, public readings of weird fiction inspire folks to all kinds of public displays of affection, and the crowd was generally draped all over one another! Above photo is a treatment by Nikki Guerlain of my original photo. The other programming I participated in was the panel discuss, “The Future of Weird Fiction,” moderated by SJ Bagley and with fellow panelists Simon Strantzas, Silvia Moreno-Garcia, Justin Steele and Joe Pulver. The panel was well attended, and the discussion was a very good one, with lots of interesting talk about the state of weird fiction, how it’s changed since the old days. Most interesting was the section in which each of us suggested writers (or in a few cases, editors or publishing venues) we thought likely to be part of the vital future of our subgenre. 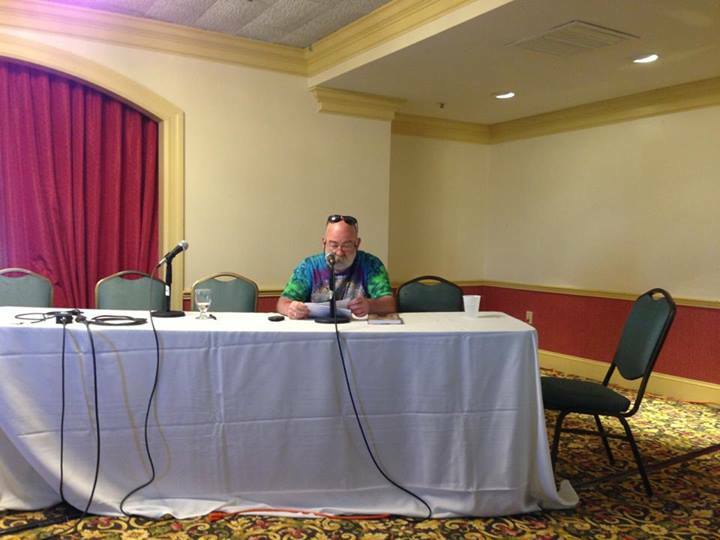 One disappointing aspect of the panel is that I had offered to help Scott Nicolay record the audio of the panel, which Scott hoped to feature on his interview podcast The Outer Dark. Unfortunately, we must have fumbled the handoff of my digital voice recorder, and we only captured the first few seconds of preliminary murmuring, and none of the good stuff. My apologies! This would have been an interesting recording to revisit later. Above photo is by Scott Nicolay. Speaking of Scott and The Outer Dark (note my t-shirt), here we are after breakfast at Viva Mexico Cantina. All these photographs of readings and panels and other such events might lead one to believe the convention experience to be something formal or at least organized. This is not true. The most important aspect of the convention experience is the informal meeting with friends and associates we meet in hotel lobbies, on the sidewalk, in various bars, or in that most honored off-schedule event, the room party. 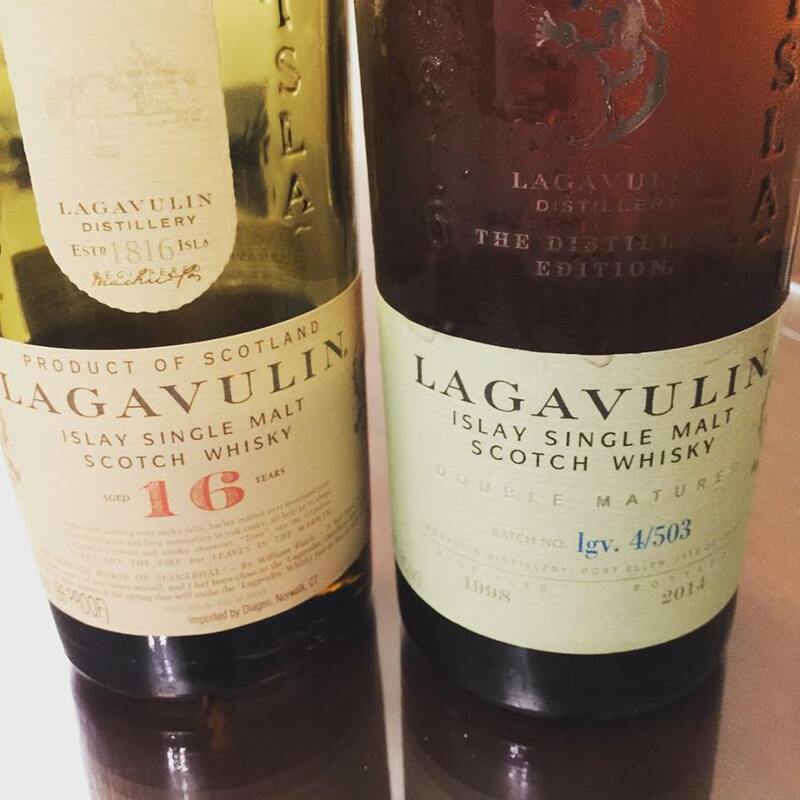 I photographed these bottles of Lagavulin in John Langan’s room party. I brought the bottle of Lagavulin 16 in honor of the 2013 Langan/Barron room party, where both Michael Cisco and I brought a bottle of the same, without advance planning. This is the kind of thing you might get when you come to these conventions. 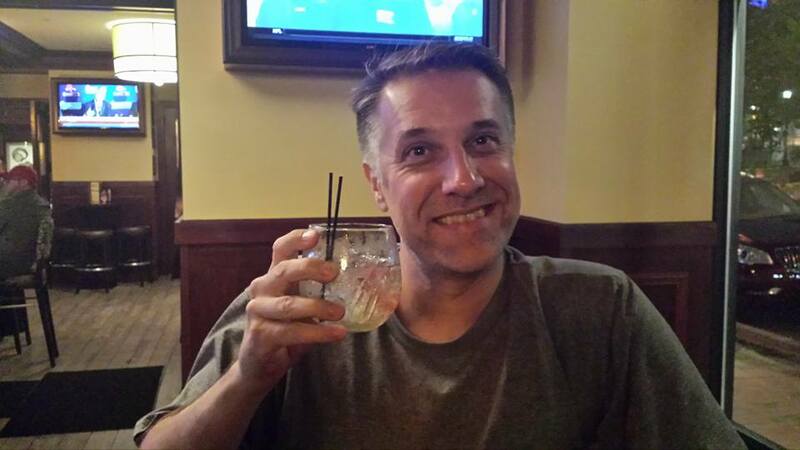 Remember, kids, when the writing pros say “conventions are important for networking,” what they really mean is good Scotch whisky. Room parties are great, but I also mentioned hanging around in bars. Here’s a photo of me in the McCormick’s bar. At this event, I met for the first time (in person) my wonderful friend, the excellent writer Damien Angelica Walters. She was drinking many, many of these light, fragrant and sort of flowery beverages, the Prosecco sangria. I told her these were eroding her talent and weakening her writerly fortitude, and that she’d be much better off to drink good, brown Scotch and bourbon. She convinced me to try one of these. Look, I’m drinking it! I tried to make the most insipid face I could for this photo, but I don’t look appreciably more or less silly than usual. What conclusions should be taken from this, I remain uncertain. The drink sure did smell pretty, though. All herbs and sugar and spice and flower petals and unbearable lightness. 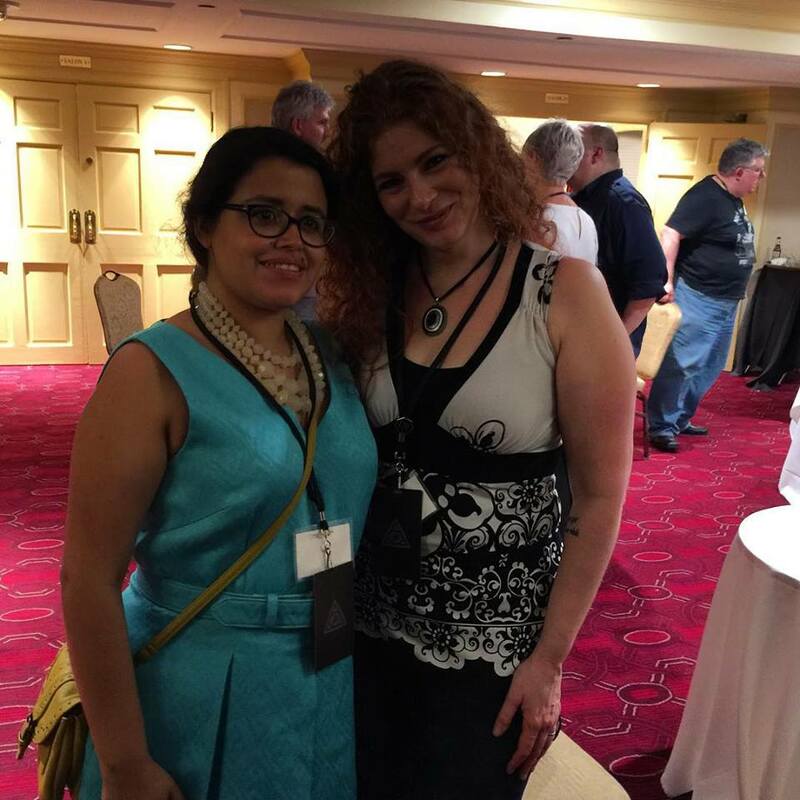 Speaking of Damien, here she is alongside Silvia Moreno-Garcia, who was a Guest of Honor at the event, as well as my co-panelist on the Future of Weird Fiction panel (see above). It’s a wonderful and unusual thing to see convention attendees wearing something other than black t-shirts with pictures of tentacle things! More loitering and tomfoolery in hotel lobbies. 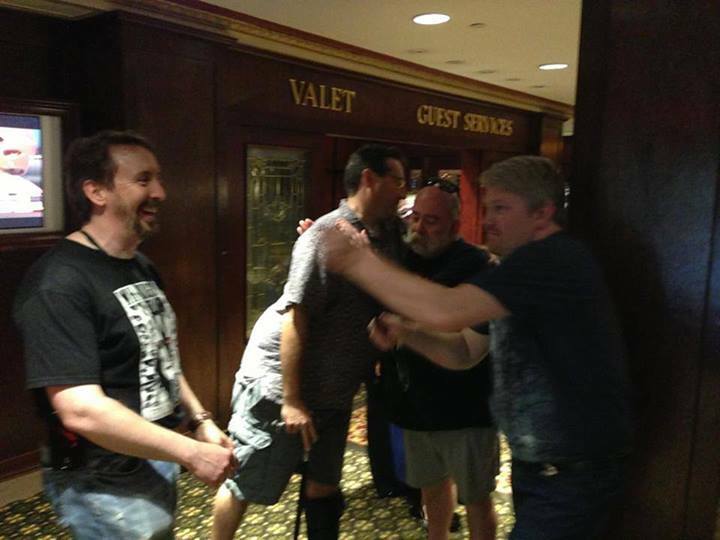 Here Paul Tremblay and John Langan gather to stroke the sultry facial hair of noted Canadian beardist, Simon Strantzas. This takes place in the lobby of the Biltmore hotel, a classy joint, despite the presence of persons such as the ones shown here. 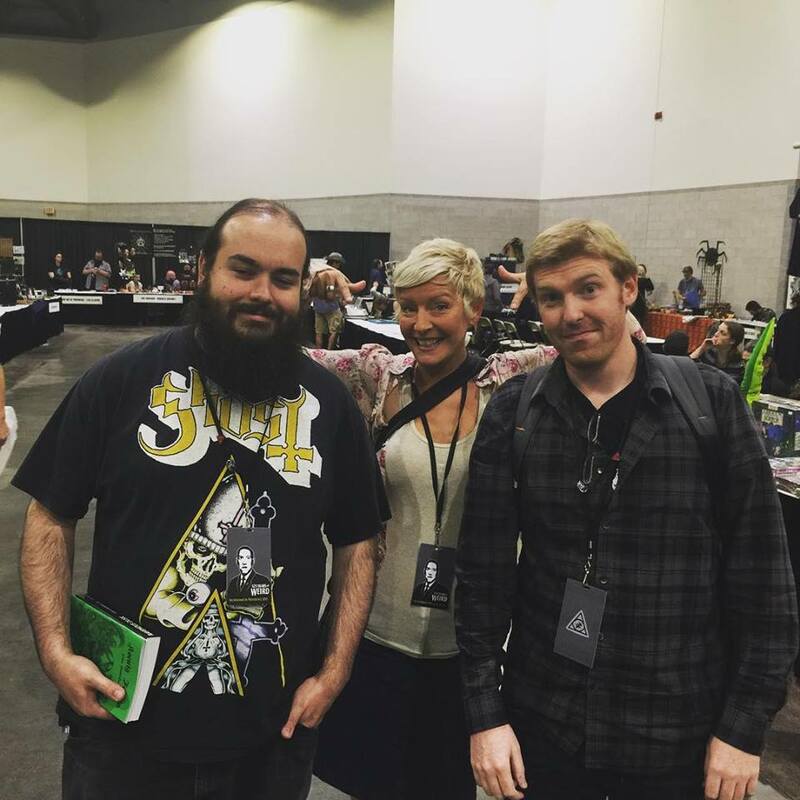 Speaking of disreputable types, here we have Charles (left) and Sean (right) of Miskatonic Musings podcast, with my wife Lena in the dealer room. I should have spent more time in the dealer room this year! It was a wonderful thing. 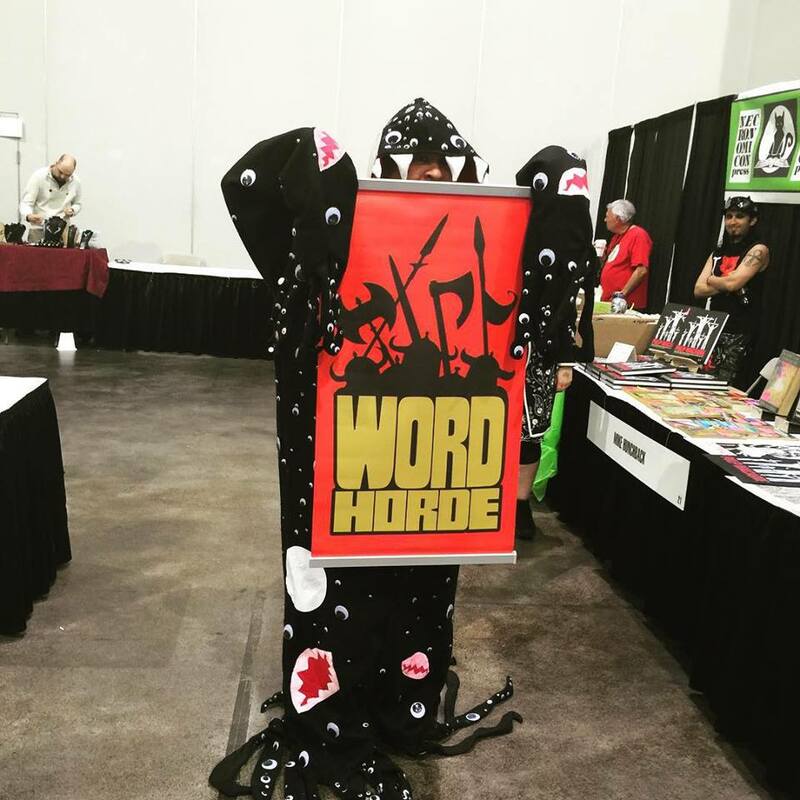 Also in the dealer room, here we have Matthew Warren Richey in his excellent shoggoth costume, carrying the Word Horde Banner. This costume is the boss of all costumes. Good job, Matthew! From what I was able to tell, at the Word Horde vendor table Ross Lockhart sold out everything, and his table-mate Scott R Jones did as well. I also know Sam Cowan was happy with how sales went at the Dim Shores table. I love to hear of vendors doing well, because it means publishers and sellers of books are moving lots of the things, and that readers are eager to grab them up. Here a large group of us dared to leave the immediate circle of the Omni and Biltmore, and ventured across Providence in search of food. I love a good walk, and it was nice to see a different part of town. Everyone wanted to stop by this creepy old horror house (sorry if you live there and are offended by this characterization, but it can’t be helped — a bunch of visiting weirdos wanted to be photographed in front of your place for a reason) just down the street from the restaurant. Pictured here (L-R) we have Lena Griffin, Erin Jane Laroue, Nathan Carson, Ross E Lockhart, Scott Dwyer, Heidi Ash, Justin Steele and Tom Lynch. I was also present, behind the camera, and will forever regret not appearing in this photograph. 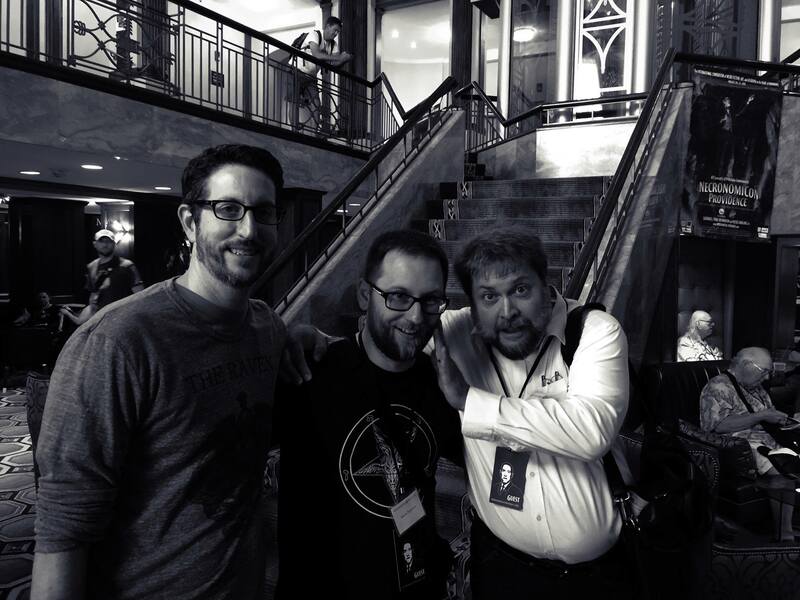 At every horror-centric convention, it’s best to expect to rub shoulders on at least one occasion with true horror. Here I am in conversation with the nightmare demon who had taken the form of John Langan just moments before. All good things come to an end… don’t they? Deliriously happy yet exhausted, we made our way to the airport for our return home. But the convention was not yet over! Right behind us in line, who should appear but artist extraordinaire and all-round top fellow Nick Gucker, cover artists of The Doom That Came to Providence (see above). Nick was carrying some excellent reading material for the flight, one of my very favorite short story collections of the past half-decade or so, AT FEAR’S ALTAR by Richard Gavin. You see, even when you think the time of your life is done, it’s not really over. See you next time! Wow, it’s almost time! Wednesday night, Lena and I will fly to Providence, Rhode Island for the 2015 NecronomiCon event. I’m looking forward to seeing friends and taking in all the amusements on offer. Also, I’m a guest of the convention, and will be participating in a group reading and a panel discussion. You can see the entire schedule HERE. What is the future of weird fiction? Is it chained too strongly to the ghost of Lovecraft or can it still explore new vistas of horror? This panel discusses the current state of weird fiction today and where it might go in the future. Or, is there NO future? If you see me around, feel free to come up and say hello. If you’ve got a copy of a book in which my work appears, I’ll be glad to sign it. Everybody had such a great time at the last NecronomiCon in 2013, and this one promises to be even bigger and better. Hope to see you there! Now that we’re all recovering from last weekend’s CthulhuCon, it’s natural to begin thinking about upcoming conventions… the next time friends will be able to converge this way. There’s a good chance I’ll attend ReaderCon in July, and I’m definitely going to NecronomiCon in Providence in August. The current schedule for NecronomiCon is HERE, though it hasn’t yet been updated to reflect the fact that it appears I’ll be participating in at least one panel (a very interesting one, alongside some most excellent fellow panelists) and a reading. I’ll share details once things are a little more certain. The first event that really let us know NecronomiCon Providence was getting into full swing was the dinner at McCormack and Schmick’s restaurant on the ground floor of the Biltmore Hotel, where most of us were staying. 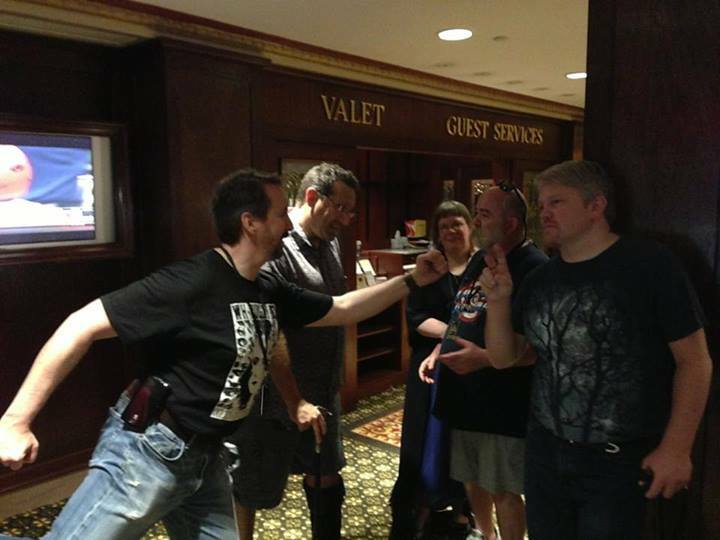 A few of us casually clowned-around in the hotel lobby, and Tom Lynch started murmuring about dinner. In the first photo, Tom Lynch(L) and Mike Davis (R) get ready to rassle in the foreground, while behind them Peter Rawlik and Joe Pulver enter into a tender embrace. If you were within range of my camera at this moment, that meant you were cool enough to be invited to McCormack and Schmick’s by Tom Lynch of Miskatonic River Press, fine publisher of such tomes as The Grimscribe’s Puppets, A Season in Carcosa, and more. Tom’s treat! Let the following image serve as proof of the deep silliness on display among this crowd. Lady Lovecraft appears in the background here. 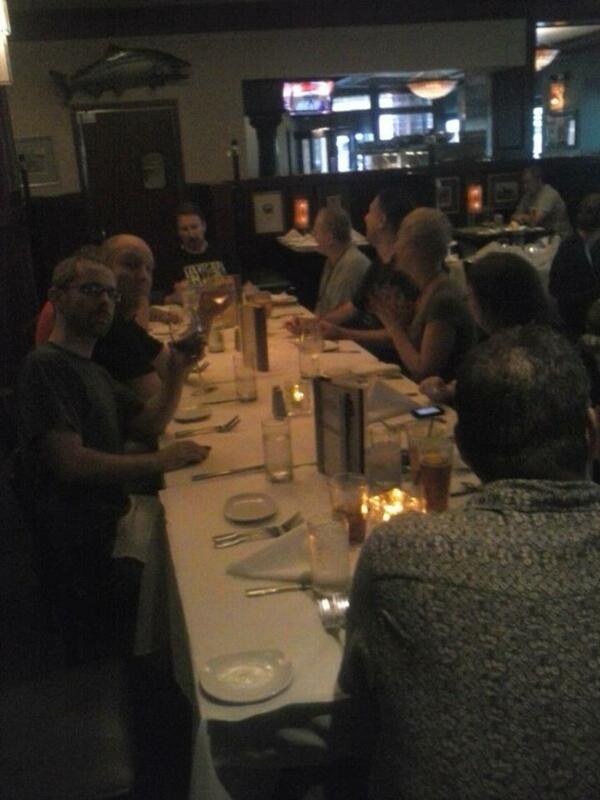 We managed to persuade this nice restaurant to give a large table to a bunch of roughnecks and buffoons. They even treated us like normal patrons. In the next picture, Sam Cowan (L) displays his copy of The Grimscribe’s Puppets, opposite me, uploading photos from my phone, while in the background Boss Tom Lynch and bEast Pulver tell Sam “what’s what” as far as that Grimscribe’s book. Sitting between Sam and Tom is David Rankus. At this stage, Sam is talking about possibly getting some writers to sign the book. I mentioned I’d never signed a book before, which provoked a bit of discussion, mockery, amazement, etc. I ended up signing many books over the weekend (not sure how many — a few dozen at least) but Sam Cowan received the first. See inscription below. I joked with him that if — when! — I’m hugely famous, the book will be worth $8 million, and he’ll be especially glad he attended this dinner! Lady Lovecraft took this photo across the table — so you can’t see her, but that’s Blair Leggett and Sam Cowan. This video, provided by Mike Davis of Lovecraft eZine, gives a good idea of the zany atmosphere. They’re trying to convince Cthulhu to eat one of his own distant relatives. 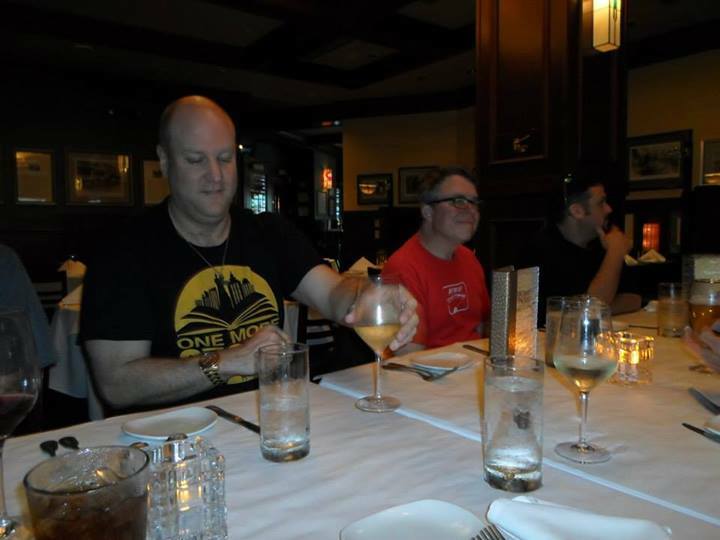 Mike also took this picture from his end of the table, primarily focusing on the back of Peter Rawlik’s head, and Mike’s own empty seat. On the left, that’s Vince LaRosa and Blair Leggett. Behind Blair you can almost see Sam’s red shirt. At the head of the table is the Boss, the Man, the Honcho… Tom Lynch. On the right, Lady Lovecraft has her head turned, then Lena, then me, then Jeffrey Thomas. Dinner was very good, if a bit excessive. Tom told the waiter which appetizers interested us, and allowed said waiter to decide what quantity of appetizers was appropriate for a table of our size. I think we ended up with 15 or more appetizers… a bit much! The bacon-wrapped shrimp were damn good, though, and I’m always fond of crab cakes and calamari. Very fine company, a tons of fun. Our sincere thanks to Tom Lynch and Miskatonic River Press for making this happen, bringing us all together, and footing the sizable bill! In an earlier post, I mentioned the surprise reading. If you don’t know what I’m going on about, check out Reading Between Greats and come back. Joe had already warned me and Scott Nicolay we must be present, so we had an idea he had some plans in store. 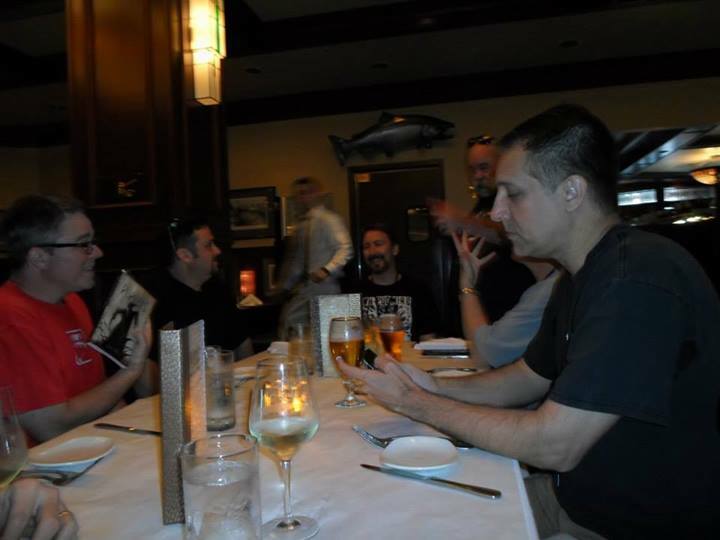 When this picture was taken, Joe was up at the table fiddling with paper. 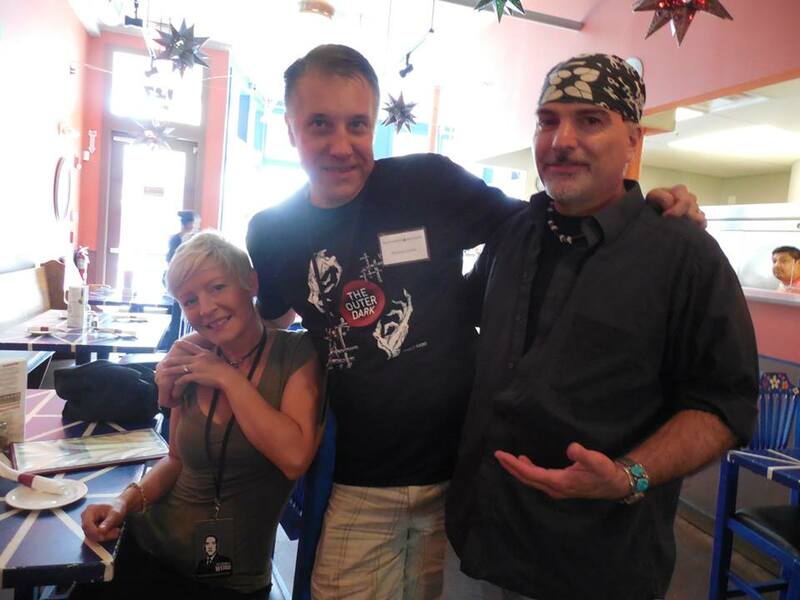 That’s me, Lena, Scott Nicolay and Lady Lovecraft in front. Behind LL is Justin Steele, behind him Cody Goodfellow, and waaayyyy in the back, Laird Barron. 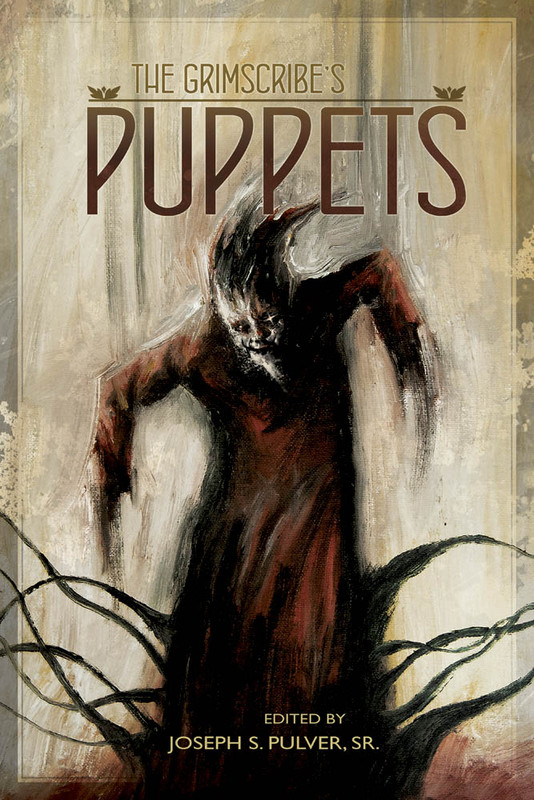 He carried along a copy of the anthology he edited, The Grimscribe’s Puppets, but didn’t read from it. This didn’t seem unusual. Lots of writers carry their latest book up to the table or stage during readings and panels, so people will see it and be mind-controlled into buying a copy. Joe’s reading was excellent. He stopped about halfway through his story, and said he and Laird both felt strongly about the importance of helping boost newer writers by lending attention and offering endorsement. 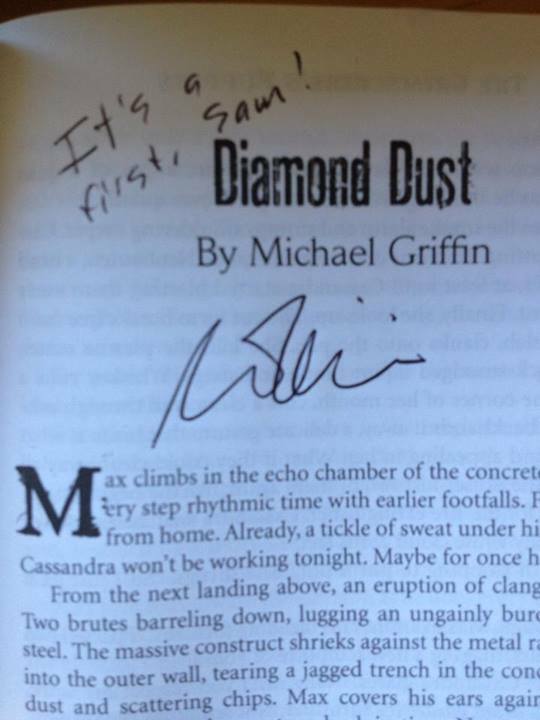 He held up his copy of Grimscribe’s, said a few flattering things about me and about Scott Nicolay, and asked us to come up and read selections from our stories in that anthology. Me first. I recall thinking “I should be really nervous.” I did feel on the spot, unsure how to begin. A story came to mind, a recurring dream I used to have about going to a David Bowie concert. I’d sit in the front row, and before the band started, Bowie would call me up to the stage and insist that I play guitar for them. I’m certainly no guitar player, but in the dream, I make a go of it, convinced that good intentions and zeal will allow me to bluff my way through, playing in place of Ronson, Fripp and Alomar. It seemed to go well, though that’s hard to gauge as it’s happening. People applauded. Scott Nicolay came up, and wisely skipped the sort of preamble and introduction I offered. He read a chunk of his excellent tale, “Eyes Exchange Bank,” drawing laughs in all the right places. Laird Barron came up last, and read the entirety of “D T” from the Pulver-edited King-in-Yellow-themed anthology, A Season in Carcosa. It’s a wonderful story, full of dark unease as well as humor, and pseudo-biographical portraits of recognizable figures, primarily Karl Edward Wagner. I’ve read “D T” several times before, and very much enjoyed hearing it in Laird’s own voice. The reading came full circle, from Joe mentioning Laird’s inspiration in his story, to Laird reading his story from a book edited by Joe. And in between, two writers with the highest respect for Barron and Pulver. This was a very special opportunity for Scott and me. Afterward, many people came up and said nice things. We all signed many books, that is, Scott and I signed The Grimscribe’s Puppets, and Laird and Joe signed their many, various other things. I watched one guy pull out a stack of at least a dozen Barron collections, novels, and anthologies in which his stories appear. There were questions about Grimscribe’s, and comments from a few who had already read it. One guy told me he was going to run upstairs, buy a copy, and hurry right back so Scott and I would sign it. Also in the room were other contributors to the same anthology, such as Richard Gavin, Cody Goodfellow and Simon Strantzas, so it was a great opportunity for a reader to grab several signatures, including that of Editor Pulver. I affirmed that we were. He said he’d enjoyed the reading, and had tried to buy the book, but found it sold out. I told him he must be wrong, that he should’ve asked at the Miskatonic River Press table, because I knew they’d had quite a few copies left before the reading. It turned out he was right. There was at least some kind of run on these books after the reading. If Scott and I allow ourselves to imagine we had some part in creating a bit of buzz about the book, this is the greatest possible feeling. I’m already very grateful to be included in the book to begin with, and the reading was a wonderful treat. The book is currently available from Amazon in three formats: Hardcover (of the casewrap variety, not cloth-cover-with-paper-dustjacket), Paperback and Kindle. Direct link HERE. 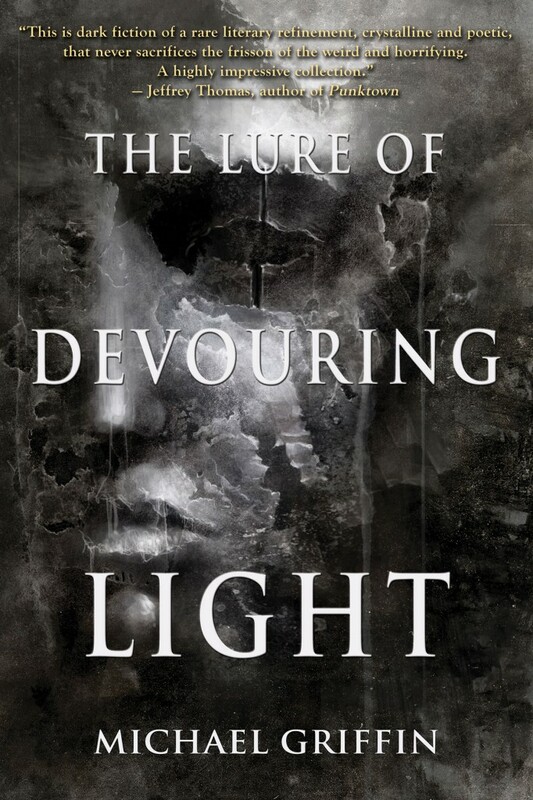 You’ll also be able to grab it from Miskatonic Press, as soon as Tom Lynch obtains more copies, HERE. Again, thanks to Joe Pulver, Laird Barron, Scott Nicolay, Tom Lynch, and everybody who attended the reading.